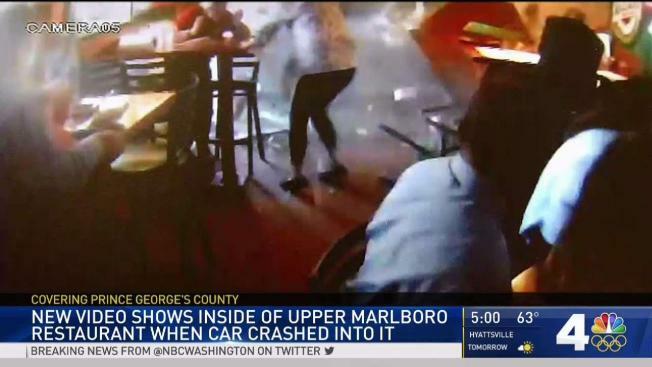 Terrifying surveillance footage from inside a restaurant in Maryland shows the moment a car smashed through a wall and into the crowded business. Ten people were hurt, two seriously, when a driver lost control and crashed through a brick wall into Babes and Boys Tavern at the Top of the Hill in Upper Marlboro, Maryland, during lunchtime Tuesday. Video shows the silver sedan barrelling into the restaurant and people frantically trying to jump out of the way. The force of the crash sent people flying. "My wife was sitting right here," bar owner Patrick J. Wilson Jr. said, pointing to the bar. "It hit her and knocked my wife into the bathroom." 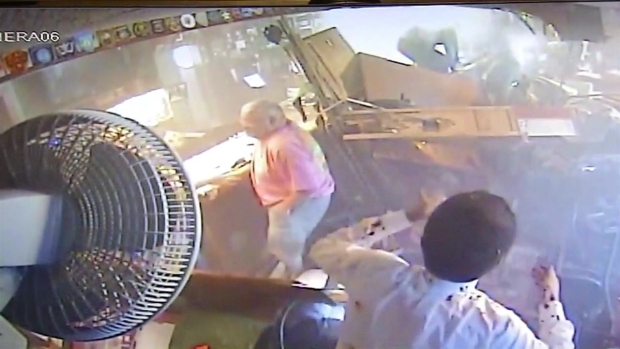 A camera inside the restaurant caught a car crashing in at lunch time Tuesday. "It's amazing that people aren't dead," he added, surrounded by wreckage. A retired county judge was among the people eating lunch in the restaurant, which was frequented by police officers and firefighters. One officer instinctively reached for his gun when the car crashed. Some initially thought a bomb had gone off. The driver, Vernelle Robinson, said she lost control. "My brakes went out," she told News4's Tracee Wilkins right after the crash. "I panicked. That's how I ended up over that hump right there." The car appears to have slammed into the restaurant "at a fairly high rate of speed," Prince George's County fire department spokesman Mark Brady said. 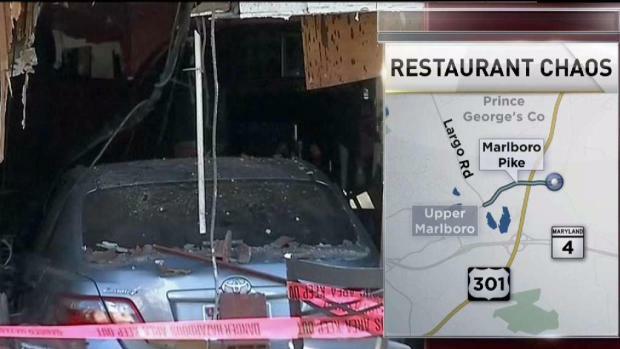 News4's Tracee Wilkins reports from outside a restaurant in Upper Marlboro. A quiet lunch hour turned to chaos when a driver lost control. None of the victims' injuries are life-threatening, Brady said. There's no word yet on whether the driver will face any charges. Several employees of the restaurant were hurt, Wilson said. "The rest of 'em just aren't going to have employment for maybe a year. I don't know. They have nothing," he said. The business owner said he's interested in fundraising to help his employees.